Start reading The Untethered Soul: The Journey Beyond Yourself on your Kindle in under a minute. "In lucid, unadorned prose, Michael A. Singer delivers the essence of the great spiritual teachings of the Ages. Each chapter of The Untethered Soul is an instructive meditation on the binds of the human condition and how each and every knot can be gracefully untied so that our souls may fly. The accuracy and simplicity of this work is a measure of its pure mastery." "The Untethered Soul is indeed one of the finest treatments of the nature and practice of the conscious use of consciousness that I have ever read.... It is the clearest statement I know of who we are and what we face in our emerging humanity." "Deep spirituality is within your reach in this book. In it you will find the mirror to see your unconditional, holy self. If you look for practical spirituality not encumbered by credo and ritual, read this book." "The Untethered Soul is a brilliant treatment of the path of spiritual consciousness. It is clearly and powerfully written. Michael A. Singer provides a firm step for those on a spiritual journey." "This publication has released boundless joy for the hungry souls of the world." "East is East and West is West, but Michael A. Singer bridges these two great traditions in a radiant treatise on how to succeed in life from our spiritual quest to our everyday tribulations. Freud said that life was composed of love and work. With great eloquence, wit, and compelling logic, Singer's brilliant book completes this thought by showing them to be two poles of the same selfless devotion." "This is a seminal book that quite frankly is in a class by itself. In a simple, yet paradoxically profound way, Michael A. Singer takes the reader on a journey that begins with consciousness tethered to the ego and ends having taken us beyond our myopic, contained self-image to a state of inner freedom and liberation. Michael A. Singer's book is a priceless gift to all who have futilely searched and yearned for a richer, more meaningful, creative life." "In the book The Untethered Soul, Michael A. Singer takes you step-by-step through the process of Gyana, the yoga of the Intellect, to the Source. Moreover, he does it with elegant simplicity. Read this book carefully, and you will get more than a glimpse of eternity." "Michael A. Singer has opened my mind to an entirely new dimension of thought. Through The Untethered Soul, I have been challenged both psychologically and intellectually in a new and exciting way. 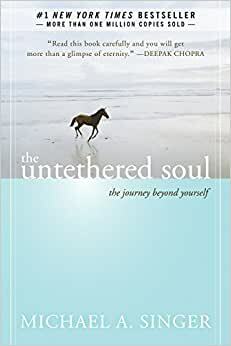 It may take more than one reading and many hours of introspection, but The Untethered Soul is a must-read for anyone in search of greater understanding of themselves and of the truth." "Psalm 42:8 says, 'Deep calls unto deep.' Within each human soul there is a longing for more, and the thirst can be quenched only by God. In The Untethered Soul, Michael A. Singer helps the modern person who is seeking this experience to come to a better understanding of the action in their soul. I highly recommend this reflection of one soul to another on the journey." Michael A. Singer received a master's degree in the economics from the University of Florida in 1971. During his doctoral work, he had a deep inner awakening and went into seclusion to focus on yoga and meditation. In 1975, he founded Temple of the Universe, a now long-established yoga and meditation center where people of any religion or set of beliefs can come together to experience inner peace. Through the years, Singer has made major contributions in the areas of business, the arts, education, healthcare, and environmental protection. He has previously authored two books on the integration of Eastern and Western philosophy: The Search for Truthand Three Essays on Universal Law: Karma, Will and Love.